animated TV series about a superhero team begin with an origin; Wolverine and the X-Men opens instead with their destruction. Without warning, some sort of explosive blast lays waste to Xavier's School for Gifted Youngsters. A smoldering wheelchair is the only trace that remains of Professor X, Jean Grey is nowhere to be found, and the mansion itself is a smoldering crater. The X-Men are no more. timelines -- one group of X-Men in the present and another fighting for survival in the future -- and that's balanced flawlessly as well. Both eras are equally compelling, and being able to leap back and forth between them infuses the series with quite a bit of vitality; nothing is ever given a chance to get stale. I'm really impressed by just how swiftly Wolverine and the X-Men moves, and it covers a colossal amount of ground in the space of a single season. 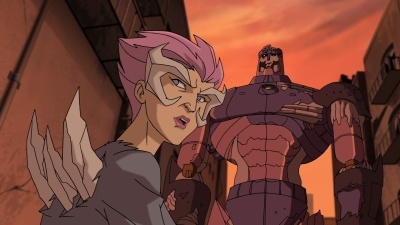 Rather than picking up where X-Men: Evolution left off, the series has its own distinct continuity, piecemealing together elements from Chris Claremont's epic run on Uncanny X-Men, New X-Men, the Ultimate books, the movies, and even a little from previous animated takes on these characters. There aren't all that many direct adaptations, but you do get an updated version of the first Wolverine and Hulk battle as well as elements drawn from Fall of the Mutants, the various Weapon X stories, Days of Future Past, the Dark Phoenix Saga, Gifted, and pretty much everything Grant Morrison hammered out in New X-Men. The list of badniks, cameos, and guest stars is endless; the number thrown out in the extras is seventy different mutants, even. To rattle off a few...? Bishop, Marrow, The Shadow King, Psylocke, Rockslide, Dazzler (the Disco Dazzler version, even! ), Mystique, Harpoon, Sabretooth, Mojo, Spiral, The Reavers, Nick Fury, Blink, Hellion, Multiple Man, Nitro, Ricochet Rita, Dust, Boom Boom, Domino, Magma, Pixie, Wolfsbane, Polaris, X23, The Scarlet Witch, The Juggernaut, Rover, Squidboy, Mr. Sinister (here just called 'Sinister'). 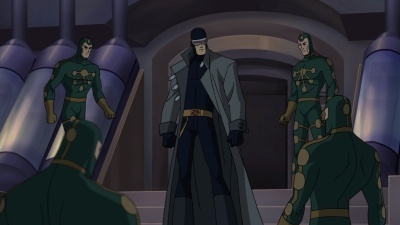 Heck, you even get a look at Wolverine in his original striped costume as well as the original five of Xavier's First Class. Wolverine and the X-Men does a terrific job juggling such a sprawling cast too. Some of those names I just mentioned only appear in the background, for one. Even glossing over those sorts of cameos, the series doesn't insist on shoehorning every character in each episode, so there's not a constant competition for screentime, allowing them to be better fleshed out individually. A select few are lavished with their own showcase episodes as well, giving them that much more of an opportunity to shine. while the Nick Fury that guest-stars here is a hybrid of the characters from the 616 and Ultimate books. No one looks embarrassing or ridiculous -- not any more than they do in the comics, at least! -- with the possible exception of Domino, whose bust is so overinflated that she's about to spill out of her top. 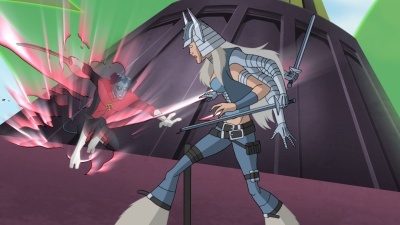 I'm kind of surprised the show could get away with that and the surprisingly faithful recreation of Emma Frost's skimpy lingeriecostume, considering this aired on a Nickelodeon-run channel and all. 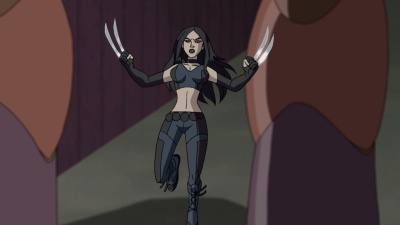 That's one of the great things about Wolverine and the X-Men, really: no, not the massive amounts of cleavage, but that the show isn't watered down. Again, it's not bogged down by reams of explanatory dialogue, instead assuming that the viewer knows who these characters are, and it offers just enough context to be kinda-sorta coherent to the uninitiated. Rather than bother with one-and-dones or small, self-contained arcs, Wolverine and the X-Men weaves together one massive story. The episodes are still individually satisfying, but it's almost always advancing the central plot at the same time, and it's kind of a thrill to see its many individual threads start to intertwine. Jiggly mounds of flesh aside, the imagery on-screen is entirely appropriate for younger viewers -- no blood and a nearly non-existent body count -- and yet it still manages to be impressively dark and intense. Sure, if a helicopter gets shot down, you'll see the pilots leap to safety on a nearby building, the same as the G.I. Joe episodes a lot of us grew up with. 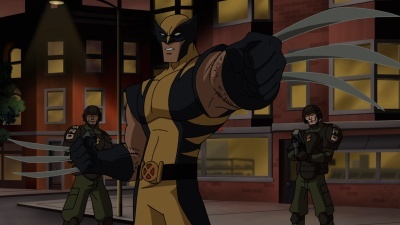 Wolverine uses his claws to square off against his opponents' weapons rather than disemboweling or dismembering anyone. It still feels as if there are stakes, though. 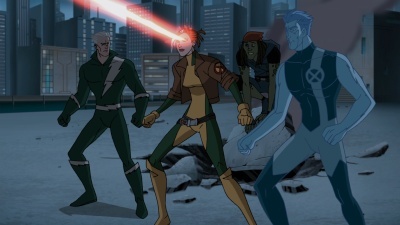 The X-Men aren't a bunch of pals who live in a mansion that serves as an oversized clubhouse; they're teammates banding together to fight a war. It's not a sunny, cheery series. There aren't all that many moustache-twirling villains either. Very few are motivated by money or greed; no matter what terrible acts they may commit, they're doing it because they believe they're right, and that's so much more compelling. The choreography of the action is really incredible too: from Domino's gymnastic gunplay to a Sentinel slamming down a nearly-severed robotic arm, these sequences are swift, acrobatic, and devastating. Wolverine and the X-Men does its job getting me invested in the story, but even aside from that, action on this scale just makes it a lot of fun to watch. 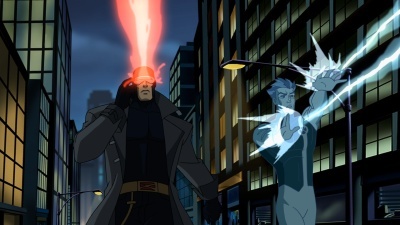 Cyclops, Storm, and Professor X lead the team time and time again, and I kind of like the idea of seeing a different dynamic, as long as it makes as much sense as it does here. 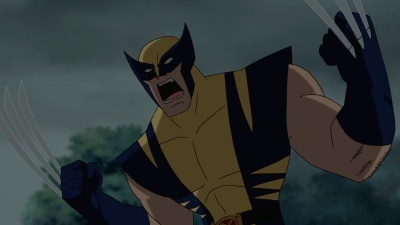 The voice acting throughout Wolverine and the X-Men is generally very strong as well. 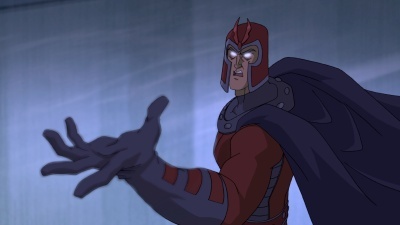 There's a noticeable attempt to have some of these characters sound like they do in the movies -- Beast, Magneto, and Professor X in particular -- and Steve Blum's take on Wolverine is a dead-on version of what I hear in my head whenever I pick up an X-book. Characters with thick accents suffer pretty badly, though. Sometimes they work, such as Nightcrawler, but others like Rogue, Gambit, and Colossus exaggerate those accents to the point that they're pretty hard to stomach. Thankfully, the worst of the bunch are fairly minor characters in the overall scheme of things. I'm really impressed by how consistently great Wolverine and the X-Men is. There really isn't an out-and-out bad installment, and considering that there are twenty-six episodes in this set, that sort of batting average is really rare for a superhero series. There are some missteps, though they're pretty minor overall. The storytelling in "Hindsight", the series premiere, is kind of choppy. 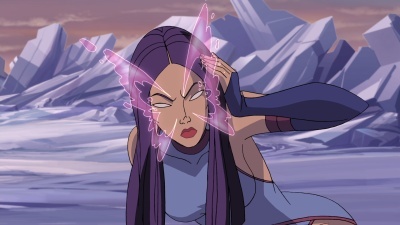 It bounces back and forth so frequently to Xavier straining before the blast that I couldn't tell at first if everything that followed was a premonition, a psychically-induced nightmare, or what. A lot happens in the three-part premiere, but the series' hooks don't really start to dig in for another episode or two after that. Gambit is in the running as the worst character in the history of anything, ever, so obviously the first of his showcases, "Thieves, Gambit", isn't exactly one of my favorites. The closest I came to outright disliking an episode is "Code of Conduct". I like the general idea -- flashing back to Wolverine's past with the woman he loved, forcing him to avoid using his claws in battle, revealing his lack of confidence as a proper warrior -- but the struggle against the Silver Samurai just doesn't resonate the way it did with me in the comics, and it feels so detached from everything else that's going on in the series. On the other end of the spectrum, it's really tough for me to try and choose a favorite. 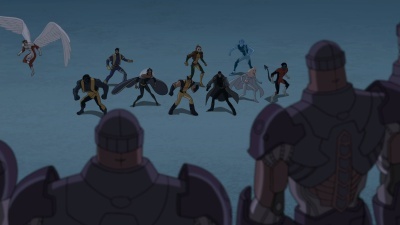 I mean, "Battle Lines" pretty much has the X-Men squaring off against Gamera. A swashbuckling Nightcrawler fends off a bunch of superpowered pirates -- unexpectedly familiar faces, all -- in "X-Calibre". The melancholy and darkness pervasive throughout "Guardian Angel", a practically monosyllabic pet Sentinel taking center stage in "Rover", the sheer number of "I can't believe they did that!" moments that dominate the final third of the season...Wolverine and the X-Men is just such a terrific series. There are little things I could nitpick if I felt like it, but Wolverine and the X-Men does so much more right than it does wrong. It's just such an endless adrenaline rush, I'm surprised how invested I found myself in its bleak, apocalyptic storyline, and its sporadic, playful sense of humor is a lot of fun too. Heck, Wolverine and the X-Men made me really like Rogue for the first time in ages and Bishop for the first time in, well, ever, so it's gotta be doing something right. 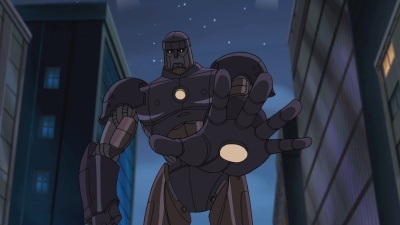 This is my favorite animated superhero series since Justice League Unlimited went off the air, and its ambitious scope allows it to easily eclipse the bulk of Marvel's direct-to-video animated movies. It's borderline-criminal that there isn't going to be a second season of Wolverine and the X-Men after all, especially after reading what was planned. Still, its first and only season tells a satisfyingly complete story, and one that's rather sprawling and epic at that. 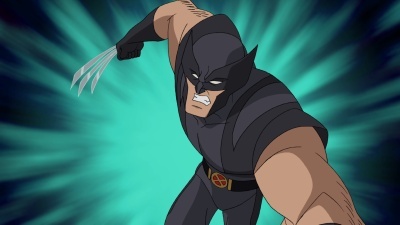 If you're a longtime X-Fan and shrugged off this series when it was making the rounds on Nicktoons, then Wolverine and the X-Men is very much worth discovering on Blu-ray. Highly Recommended. stacks of anime, and even a handful of Disney classics, but Western animated TV series have been few and far between on Blu-ray. Wolverine and the X-Men definitely makes a case that there should be a lot more of it. The animation here is spectacularly clean, crisp, and clear, and its linework is remarkably well-defined. Even with just a casual glance, this is immediately recognizable as high-definition. Its palette is rendered exceptionally well too: dominated by reds and oranges in the post-apocalyptic future while standing out as more lush and vibrant in the present day. On the downside, there is quite a lot of banding, something that's crept into pretty much all of the Marvel and DC direct-to-video titles up to this point. It's a constant nuisance here -- honestly, probably the worst I've come across on Blu-ray to date -- and can certainly be tough to overlook. The authoring is otherwise generally first-rate, with the animation not marred by any compression artifacts, mosquito noise, or edge enhancement. I have to admit that the last installment of "Foresight" does seem unusually sloppy in that respect, however; the posterization and banding is more spastic here than any other episode, leaving a few shots looking outright unstable. Still, Wolverine and the X-Men's strengths easily overcome its weaknesses. It's always frustrating to tune into sites like TVShowsonDVD.com and realizing just how few television series, period, are making their way to Blu-ray. 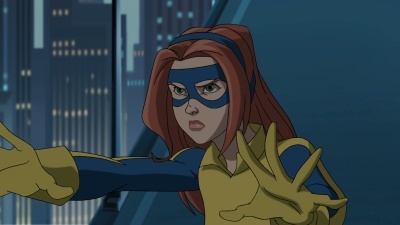 It's a pleasant surprise to see that Wolverine and the X-Men has scored this sort of release, and between this and the recent announcement of a Ben 10 volume, maybe more and more Western animated TV series will wind up being issued in high-def. Even though this particular series doesn't look perfect on Blu-ray, it's still a very strong showing, and I hope to see more like it in the months to come. All three of the discs in this set are BD-50s, and Wolverine and the X-Men takes better advantage of that capacity than a lot of the other TV-on-BD discs that I've reviewed. Each episode is presented at its broadcast aspect ratio of 1.78:1 and has been encoded with AVC. 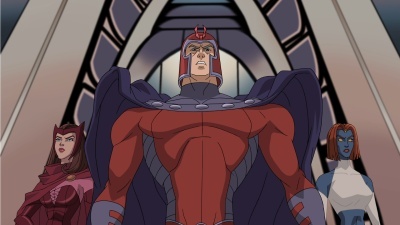 episodes of Wolverine and the X-Men are backed by thunderous 24-bit, six-channel DTS-HD Master Audio soundtracks. I can't get over how colossal a low-end this series is packing: the Blob's lumbering footsteps, ten-story robots stomping through the smoldering carcass of a city, the magnetic hum of Polaris and Magneto on the attack, and more explosions than I'd care to count, just to rattle off a few. The bassy growl of Wolverine's voice also comes through perfectly here. The sound design overall is exceptional, although the mix does prefer to keep to the front channels. The action never really claws its way into the surrounds, instead reserving them for light atmospheric effects -- ringing alarms, howling wind, cars whizzing around, and reverb in some of the more cavernous backdrops -- as well as to reinforce the score. It really does feel as if the rear channels are an afterthought. Streams of gunfire, a hailstorm, Multiple Men swarming from every direction, a few hundred thousand optic beams and laser blasts...even effects that scream out to be placed in the rears are unwaveringly rooted up front. Oh well. The voice acting is consistently clean and clear throughout, emerging flawlessly in the mix even in the series' most chaotic moments. It's understandable that the sound design would place most of its emphasis on the front speakers -- most people tuning in were probably watching it through the tinny little speakers built into their TVs, after all -- and there really is a very strong sense of stereo separation up front. The series definitely takes full advantage of the LFE, so it's a mild disappointment that it doesn't do the same with the rear channels. It's not too hard to look past that, though, and these full-bodied, spectacularly clean soundtracks are perfect in pretty much every other conceivable way. Also offered with each episode are a stereo Spanish dub and English (SDH) subtitles. Scott, her eyes are up HERE...? you'll chalk that up as a reasonable sample. Admittedly, I didn't care for the "Hindsight" tracks all that much. There are some nice comments about the look of the show and the process of working with the animators overseas, but the pace tends to be kind of slow, and they fall into the trap of just narrating what's happening on-screen an awful lot. Once Chris Yost hops into the recording booth, though, these commentaries get to be such a ridiculous amount of fun. There's just something about the combination of the three of them that makes them feel so much more at ease, and these tracks get really talkative and quippy. Kyle, Johnson, and Yost point out a lot of cameos from mutants I didn't recognize along with some other Easter eggs they snuck in. They touch on elements that would've made it into a second season, which at the time these were recorded seemed like a lock. There are some pretty great notes about some of the revisions that had to be made to play on a family-friendly cable channel, such as losing a kinda suggestively placed ring on Vertigo's costume. The three of them also discuss the headaches of Wolverine and the X-Men debuting internationally ages before popping up on these shores, prompting the widespread circulation of spoilers and YouTube bootlegs. They even note little touches I missed the first time through, such as Angel's reluctance to refer to Sinister by name when speaking with the rest of the X-Men, and they explain why some of these characters have swapped genders from what we've seen in the comics. What really makes these tracks such a blast is its sense of humor. The three of them hardly ever stop riffing on each other and some of the more ridiculous things in the show, everything from Iceman pretty much murdering everyone by encasing them head to toe in ice for much of the season, snickering at Squidboy and his doofy handle, pointing out several not-really-Batman cameos, and ribbing Chris Yost kind of relentlessly about Incredible Hulk #183...y'know, the comic that's best known for reintroducing Zzzax, although Yost remembers it differently. It's a lot funnier when they do it: pinky swear. I'm really impressed by the sheer volume of commentary tracks. I think the count is higher than any other season set I've come across...26 on the second season of Mad Men, 28 on Freaks and Geeks...I know those are twice as long and all, but still...! Piling on 29 commentaries is really impressive, and once you slog past "Hindsight", they really are an incredible amount of fun. The Inner Circle: Reflections of Wolverine and the X-Men (19 min. ; HD): Of course, if eleven hours of audio commentary are a little much for you to wade through right now, there's also this twenty minute post-mortem. A lot of the talent involved in putting together Wolverine and the X-Men is interviewed here, and they discuss the origins of the show, how they were originally assigned a Wolverine solo series whose scope they fought to expand, the sheer number of rules they broke with this show, and how surprised they are by how much this dark-edged series got away with on the air. There are also conversations with a couple of the key voice actors as well as some storyboard-to-screen comparisons. Making Wolverine and the X-Men (5 min. ; SD): The other featurette skews more promotional: recapping the premise, discussing the look and characterization of the series, and touching on how Wolverine and the X-Men tries to be both fresh and familiar. It's not a bad overview at all, but pretty much everything in here is already discussed at greater length in "The Inner Circle". Trailers (HD): A few high-def trailers for other animated Lionsgate releases round out the set. The only truly disappointing thing about Wolverine and the X-Men, really, is that a second season isn't lurking somewhere off on the horizon. I can't get over how ambitious this series is: juggling multiple timelines, its manic pace, a darkness and an intensity that far outstrips anything I'd expect from a series making its debut on these shores on NickToons. This isn't a kiddie show that's been watered down to play to the junior set. Sure, it's age-appropriate in that Wolverine isn't sopping with blood and dismembering anyone -- there's not a drop of the red stuff, no profanity, or anything like that -- but it moves at a breakneck clip, and there aren't reams and reams of exposition to drag it all down. Especially after piling on somewhere around seventy different mutants and ensuring that each action sequence is an infectious adrenaline rush, this is a series that's very much for fans, by fans. Highly Recommended.